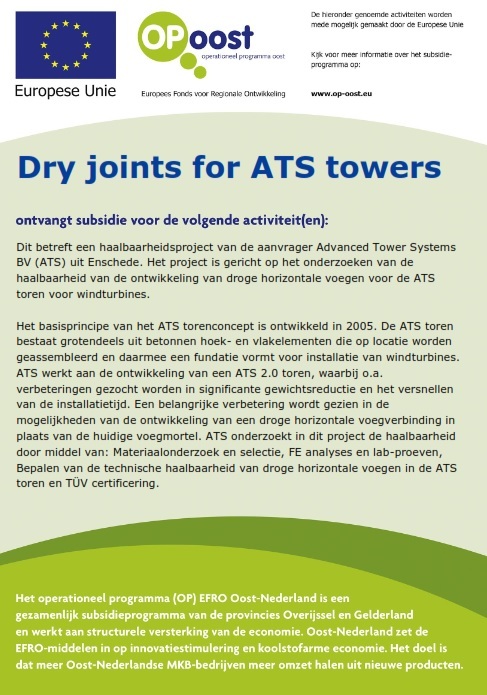 This is a grant on a research and feasibility project of Advanced Tower Systems BV (ATS) in Enschede. The project will determine the feasibility of the development of dry horizontal joints for the ATS hybrid wind turbine towers. The basic design of ATS was developed in 2005. The ATS tower is mainly made of concrete precasted corner and flat elements that are to be assembled on the location to be used as a high tower for windturbines.